On November 16, 2010, a group of former TMS students met at their beloved school in Addis Ababa, currently known as “Entoto Technical & Vocational Education Training College,” and visited the different Departments of the College and toured the Campus. Following the visit, the group met with the Administrators and Faculty and discussed the prospects for establishing an Alumni Association. An Interim Committee comprising seven former students has been established to work with the College Administration. As of this writing, (March 2013), the Committee has drafted the Bylaws and is planning to call a meeting of alumni living in Ethiopia to review the Bylaws and elect board of directors. In parallel, in March 2011, a group of former TMS students residing in the United States embarked on establishing a TMS Alumni Association in North America (TMSAANA). Registration of Alumni started in April 2011, Bylaws was drafted and approved in August 2011 and Board of Directors elected in November 2011. TMSAANA’s primary purpose inter alia is to mobilize resources to finance projects which will enhance the quality of education in our former school and provide financial assistance to needy students. Details are presented in the TMSAANA Bylaws attached in this page. Today, TMSAANA has over 200 registered members from all over the US, Canada, UK and Germany. 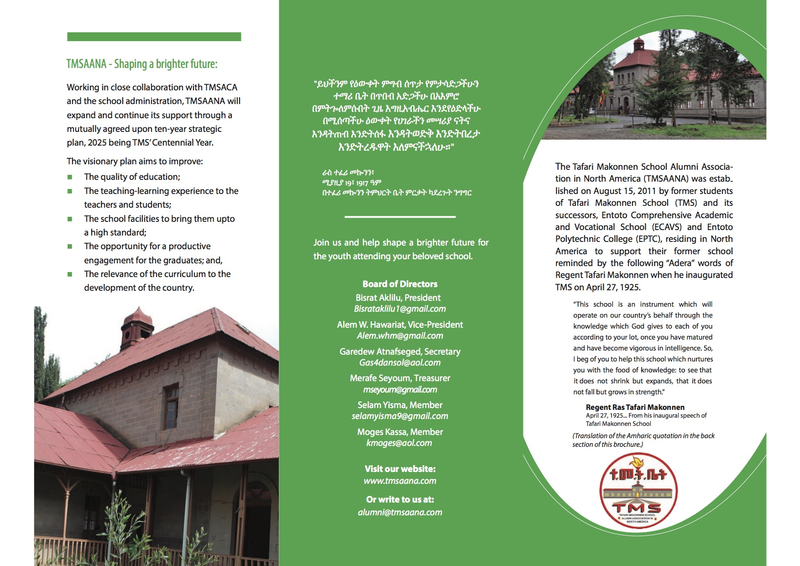 TMSAANA welcomes all former TMS students residing outside Ethiopia to register at https://tmsaana.com. 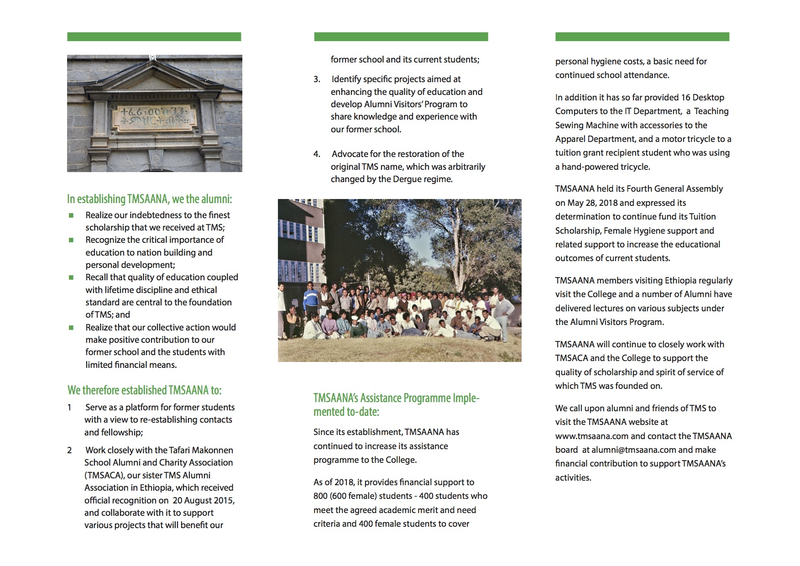 TMSAANA encourages former TMS students residing in Ethiopia to support the ongoing effort in Addis Ababa to establish an Alumni Association. The first TMSAANA General Assembly was successfully held on May 26 and 27, 2012, in Washington D.C. A Summary outcome of the GA is posted In the News and Events Page.